Journal Reference: Zheng Y, D Rosenfeld, and Z Li. 2018. 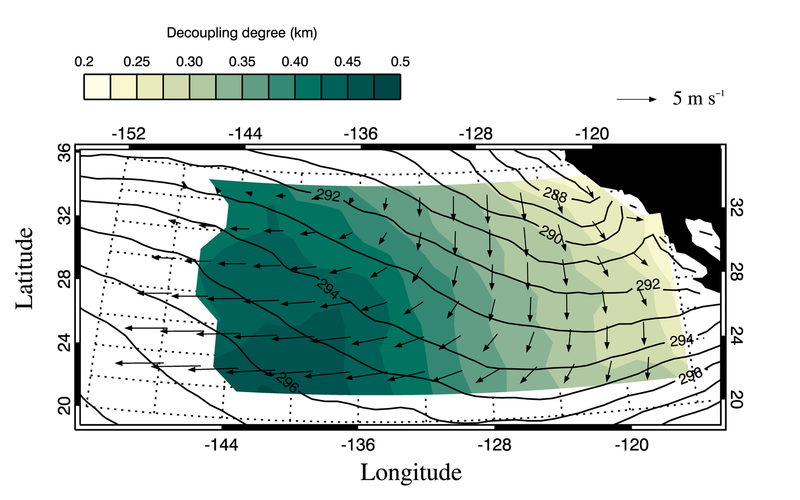 "Estimating the decoupling degree of subtropical marine stratocumulus decks from satellite." Geophysical Research Letters, 45(22), 10.1029/2018GL078382. 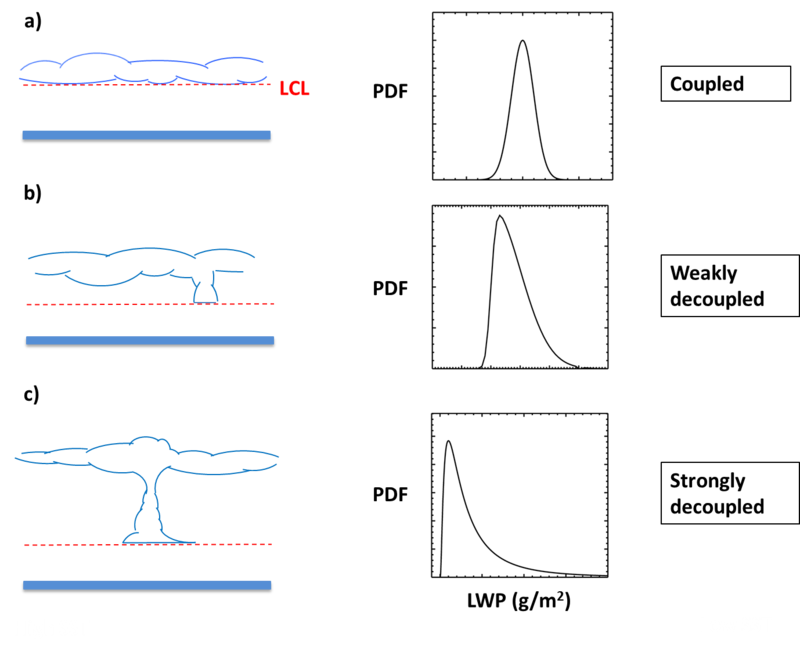 Cartoons illustrating the central concept of this method: establishing the linkages between the decoupling degree of stratocumulus decks and the skewness of LWP PDF. 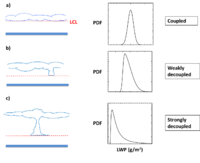 The dashed red lines mark the ifting condensation level (LCL). A climatology of the Geostationary Operational Environmental Satellite inferred decoupling degree of Sc over the northeast Pacific from October 2012 to October 2013. This study develops a new satellite remote-sensing method to estimate to what degree subtropical marine clouds are coupled with the underlying sea surfaces. The "coupling" could be understood as the exchanges of moisture, energy, and mass. The degree of the surface‐cloud coupling (SCC) considerably influences the cloud properties, which in turn modulates the temperature of our climate system. Despite its significance to climate, the SCC degree has never been measured from satellite, the only observational tool that offers global coverage. This study will fill, at least partially, this gap. In subtropical oceans, the stratocumulus (Sc) decoupling is a key intermediate process of the Sc‐to‐cumulus transitions, a persistent phenomenon that is not fully understood. This study introduces a new approach for estimating the degree of decoupling of subtropical Sc decks using passive satellite sensors. This method is limited to regions where Sc decks are advected over progressively warmer water. This is most common in the subtropics. The estimation concept is that decoupled Sc clouds under cold‐advection conditions are fed by spreading of the tops of cumulus clouds that are coupled. The cumulus clouds constitute a much larger liquid water path over small areas, which is identified by a positive skewness of the liquid water path, a quantity measurable from high‐resolution satellite data. The decoupling degree here is defined as the difference between the Sc cloud‐base height and lifting condensation level that is the cumulus cloud‐base height under cold‐advection conditions. This concept and the satellite‐based estimations are supported by ship measurements over the northeast Pacific. One‐year climatology of the satellite‐inferred decoupling degree was generated over the same region, revealing a coherent pattern of offshore decoupling, consistent with previous theory and field campaign observations.